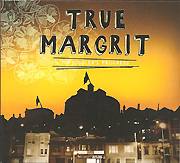 True Margrit's third long player, following up the mastery of the knockout Seaworthy, is another propulsive, piano-as-attack-dog master-craft lesson in how to roll out the pop by investing the entire rainbow of emotion, peppered by a bubble of crusty ambivalence, in songs about foibles, follies and honest mistakes. Played, once again, by the ace, core trio of piano magician Margrit Eichler, bassist Gary Hobish and percussionist Andrew Bacon, Eichler's highly literate songs roll like little 3D movies--music made for IMAX theaters, widescreen imaginations...and air pianists everywhere. Each song here is a workout that brings the senses to hair-standing-on-end attention, perhaps no more so than on the clear-the-room, here-we-come ferocity of "Syllable," during which Eichler pounds the lower octaves of her piano with singular ferocity, Bacon's cymbals providing the high-end icing to her low-end, thick cake fillilng--that is,when he isn't matching every one of Eichler's lower-range piano thrusts with bass tom precision, note for note for note. All the while, Eichler's seductive melody follows atop it all, an impossible-to-ignore hook, sinking in deep, a spectacular, top-to-bottom creation. ...Eichler's highly literate songs play like little 3D movies--music made for IMAX theaters, widescreen imaginations...and air pianists everywhere. A different kind of ferocity lies at the heart of "Lucy," about a girl who wants her emotional cake and the opportunity to engulf it, heart and soul. "I will not wed thee, I am free," she sings, stating categorically that she will have her life both ways. It's a demonstration of duality that we have all been witness to in our lives, if not out and out performed, a crisscrossed emotional roller coaster that we satisfy by putting off a decision until whenever. Listening to Eichler and her cohorts playing this ride out builds to a breathtaking musical compote, underpinned by Gloria Justen's hefty violins. "I will not wed thee, I am free," Lucy sings, and the strings give way to Bacon pounding the skins, Hobish bashing his bass, and Eichler pulling the melange together with a determined head-to-toe wash of the piano from top note to bottom. It's a tremendous moment. As are the other moments, deceptively momentary, across the canvas on which this album paints--in the straight-ahead, sing along pop majesty of "500 Years," which correctly sums up our out of control pop culture with the assertion that "If they see any charm in our legacy/It proves they've never seen reality TV,"; in the beautiful, melodic ballad "Metaphor," which turns the "rose is a rose by any other name" theory of life on its pinpoint head; in the opener, "Opposite Man" and its album coda cousin, "Opposite Opposite Man," songs about duality both, which, come to think of it, is The Juggler's Progress in a nutshell--an album-length consideration of the art of choosing, right or wrong or right again. Margrit Eichler: a writer of pop songs with a lofty, ambitious goal? Elucidation? Entertainment? Both, I'm sure. Set your CD device on play and prepare to be stunned with a song cycle that has no equal in these early days of 2010. Cherish the progress of this musical juggler. You too will wish you were the opposite man.